Algeria has announced sweeping media reforms to allow private radio and television stations to exist for the first time since independence in 1962. The moves comes as the government battles to contain popular protests against the lack of freedoms, high unemployment and corruption. The cabinet also approved plans to drop prison sentences for journalists convicted of libel. 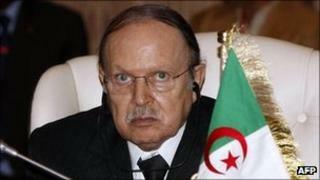 President Abdelaziz Bouteflika said the proposed changes would boost democracy. They would come into effect once parliament - controlled by the ruling National Liberation Front (FLN) - voted them into law, he said. The cabinet said the changes were part of a package of reforms promised by Mr Bouteflika in a national address on 15 April. At the time, he said the government would publish a new information law and amend the constitution to "strengthen democracy". Although Algeria has a lively private press, local TV and radio stations are tightly controlled by the state. Many Algerians watch satellite TV, correspondents say. The cabinet also said a new commission, which would include journalists, would be created to regulate the press. It would approve new press licenses - a task previously performed by the justice ministry - and impose fines for libel, the cabinet said. Journalists would no longer be jailed for libel, it said. However, newspapers could still be banned or suspended if they threatened state security. Algeria has been hit by popular protests since last year, amid demands for more freedoms and better living conditions. In February, Mr Bouteflika lifted the state of emergency that had been in force since 1992. Three other North African leaders - Tunisia's Zine al-Abidine Ben Ali, Egypt's Hosni Mubarak and Libya's Col Muammar Gaddafi - have been overthrown following uprisings against their rule. Mr Bouteflika has been in power since winning controversial elections in 1999.